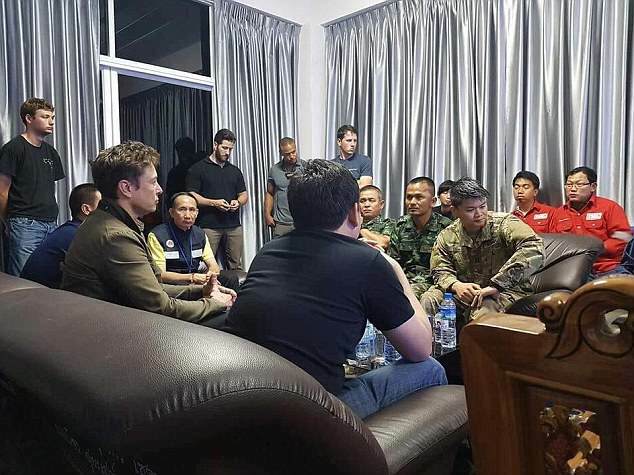 Elon Musk has become involved in a spat with the British rescue diver responsible for saving 12 Thai boys from a flooded cave - labeling him a 'pedo guy' in an astonishing and unsubstantiated personal attack. 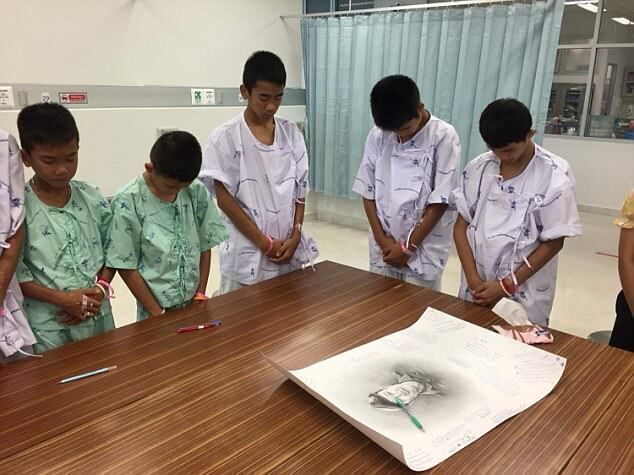 The boys and their football coach were saved from the Tham Luang cave by an international team following a week of tense rescue missions. 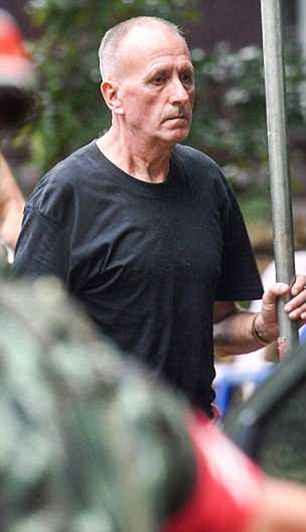 In the face of backlash over his baseless comment, the billionaire doubled down, claiming the expat diver's decision to live in Thailand was suspect ('sus'). Writing via his Twitter page, he attempted to cast doubt on whether the Brit was even involved in the rescue. 'Never saw him at the cave,' he wrote after the experienced caver rubbished Musk's own plans to save the boys. 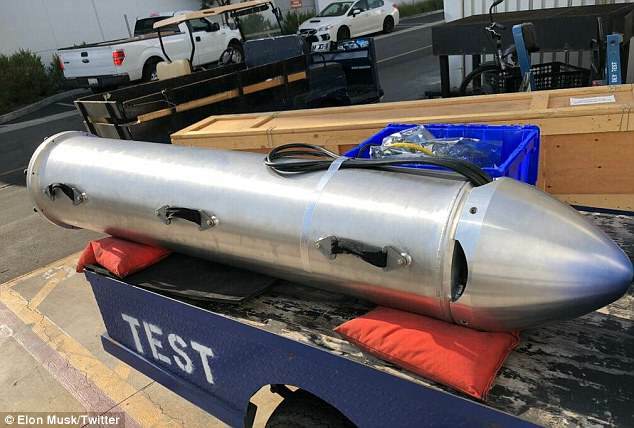 The Tesla boss and tech entrepreneur had previously offered to assist the rescue mission by building a miniature submarine. But this idea was dismissed by 63-year-old Vernon Unsworth who accused Musk creating a 'PR stunt'. Unsworth, who led parts of the operation, said Musk 'can stick his submarine where it hurts'. Later, when challenged by a social media user, Musk refused to withdraw his groundless attack. 'Bet ya a signed dollar it's true,' he wrote. 'It just had absolutely no chance of working. 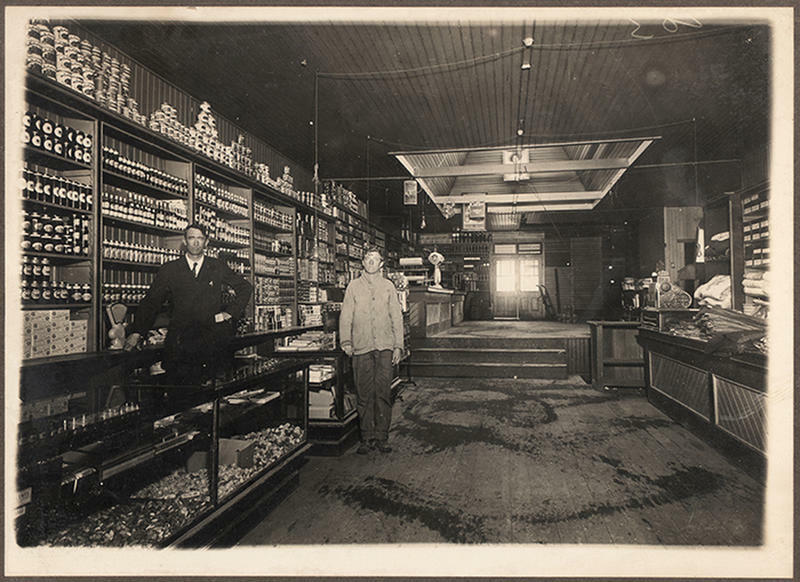 He had no conception of what the cave passage was like' Mr Unsworth earlier told CNN. 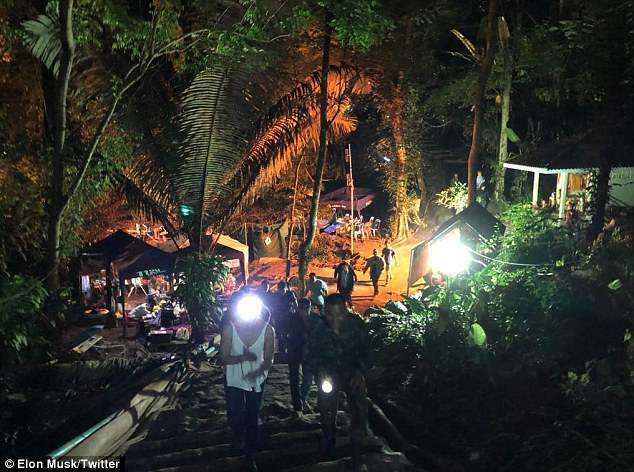 In a series of tweets responding to a journalist Musk said: 'Never saw this British expat guy who lives in Thailand at any point when we were in the caves. Only people in sight were the Thai navy/army guys, who were great. Thai navy seals escorted us in — total opposite of wanting us to leave. 'Water level was actually very low & still (not flowing) — you could literally have swum to Cave 5 with no gear, which is obv how the kids got in. If not true, then I challenge this dude to show final rescue video. Huge credit to pump & generator team. Unsung heroes here. 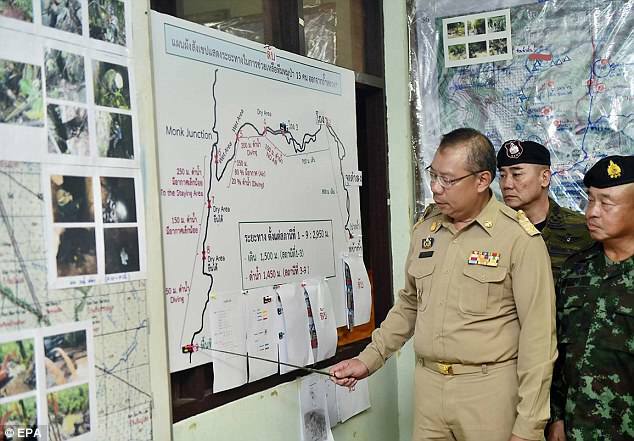 Mr Unsworth knows the Tham Luang cave system where the boys were trapped very well, as he has spent years exploring it. 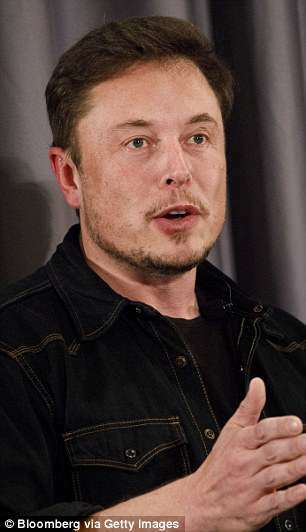 Musk was mocked online after the boys were rescued without the aid of his submarine - but he has hit back at critics and said the dive teams encouraged him to continue the work. 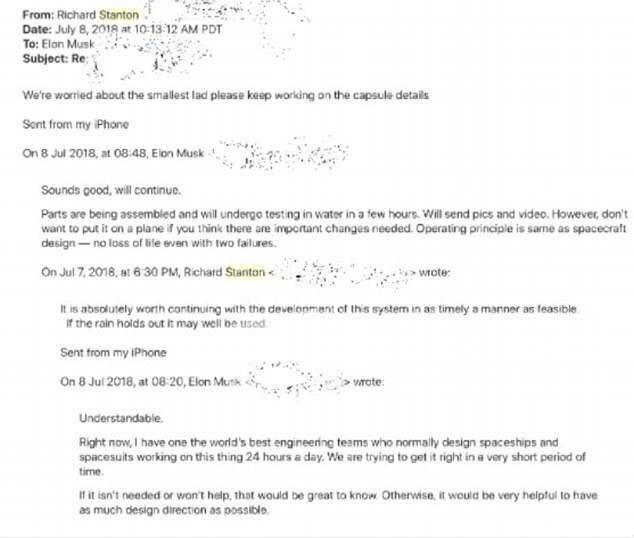 Musk earlier tweeted a screenshot of an email from Richard Stanton, who co-led the dive rescue team, asking him to keep working on the submarine. 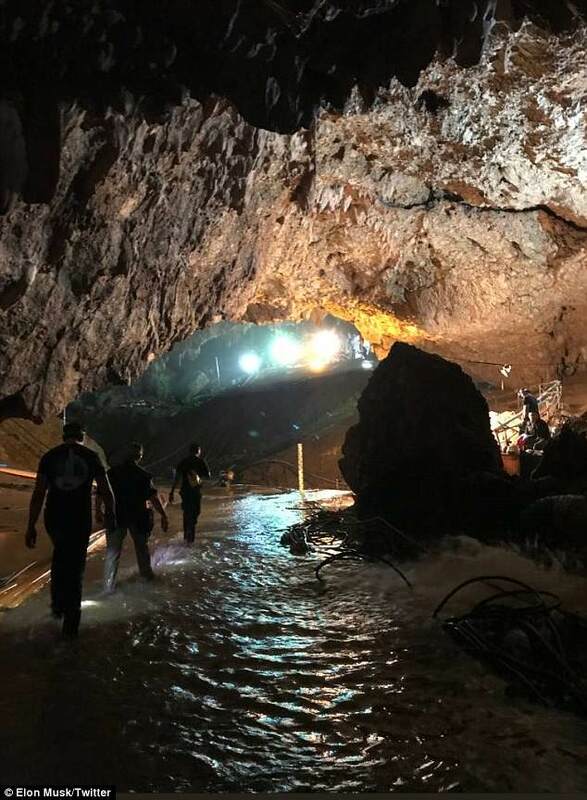 He said that 'former provincial governor' Narongsak Osottanakorn had been wrongly described as the 'rescue chief', adding that Osottanakorn - the man who rejected his sub - is no expert in cave rescue. The actual expert, according to Musk, is a man by the name of Richard Stanton who encouraged him to build the submarine, saying it 'may well be used'. Elon answers: 'Right now, I have one [of] the world's best engineering teams who normally design spacesuits working on this 24 hours a day. 'We are trying to get it right in a very short period of time. 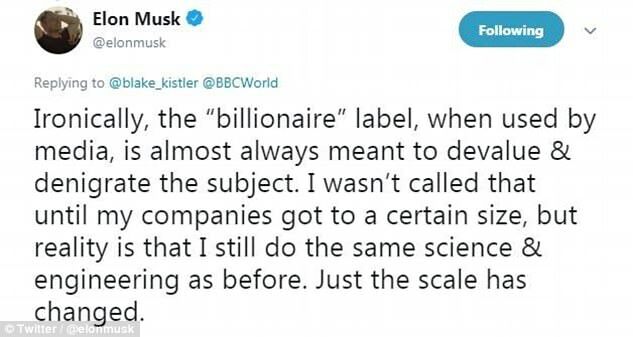 Musk also took to Twitter to bemoan being labelled a billionaire in reports about his involvement in the rescue - despite the fact he's worth £15billion. 'Ironically, the 'billionaire' label, when used by media, is almost always meant to devalue & denigrate the subject' he said. It comes as Musk denies being a top donor to a PAC aimed at keeping Republican control of US Congress - despite being listed on the Federal Election Commission's website as being so. 'Reports that I am a top donor to GOP are categorically false. I am not a top donor to any political party,' he tweeted Saturday, following The Hill's report on the annual fillings released by the FEC this week. The FEC shows Musk was among the top 50 donors to the Protect The House, Political Action Committee (PAC) giving a total of $38,900. The sum is modest in comparison to other donors in the FEC filings. Microsoft co-founder Paul Allen donated $100,000 to the PAC while Houston Texans owner Bob McNair gave $371,500. Perhaps Musk is parsing words, being in the top 50 out of 350 people may not constitute a 'top donor' for Musk.